It's been little more than 4 years with my Hiace and it has done around 76,000kms so I thought its time I give you guys an update on it. 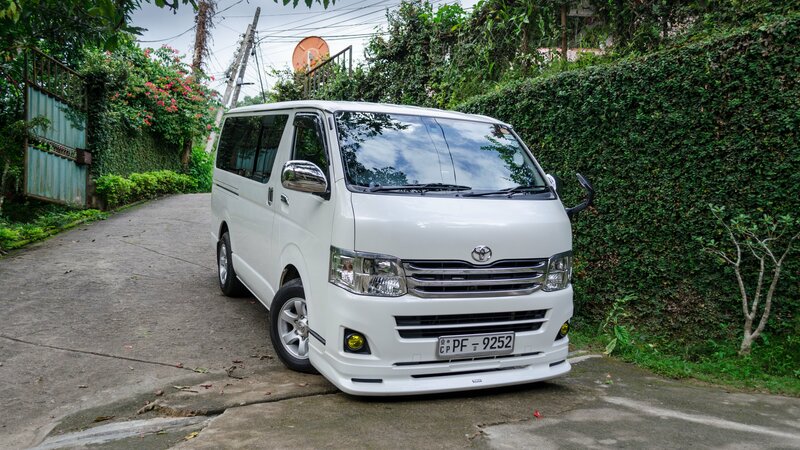 Let me start the blog with the basics, Mine is a Toyota Hiace KDH206, this variant of Hiace is fitted with a 1KD-FTV turbo engine with an all wheel drive system. The AWD system in the KDH series is pretty much full time, it runs on all four wheels normally and if any of the wheels experience a slippage, the vehicle stops sending power to that specific wheel. There is a noticeable difference between the AWD variant(KDH206) and RWD variant(KDH201). The KDH206 is around 100kg heavier and you could feel that through the steering when you drive one. In addition, the KDH206 feels far more planted at higher speeds and around corners than the RWD variant. However the downside is that the full time AWD system drinks bit more fuel than RWD version. Cost of Maintenance In short the Hiace is not cheap run, I get fuel economy of around 6km/l in kandy and around 9-10km/l outstation, the RWD KDH201 would return around another extra 2km more per litre. Hiace is originally fitted with 195/80R15 8ply tyres and they cost around 22-23.5K per tyre from brands like Continental or Pirelli, while Maxxis tyre could be found for around 16k. It requires super diesel and this is an absolute must, if you regularly pump auto diesel you will pay more in repairs than what you saved by pumping auto diesel. The most likely issues you would get from pumping auto diesel are DPF, which costs around 70-80k to replace and injectors, which would set you back around 500k for all four. So far I had to change only a bush which costed around 50rs, apart from that I have not had any repairs. Performance The Hiace pulls pretty well for a vehicle which weighs 2 tonnes, the 1KD-FTV with a variable nozzle turbo produces 100kw at 3400RPM and 300nm of torque at 1200-3200rpm and it is connected to a 4 speed conventional automatic gearbox. Overtaking other vehicles with Hiace is pretty easy, you just have to put your foot down, the turbo will come to life and you would be gone. It is always on the right gear, there's no unnecessary downshifts or up shifts, the gearing ratios are perfectly synced with the power band of the engine although it is only a 4 speed gearbox in a world of 6 and 7 speed gearboxes. Handling is fairly good for a van, it handles better than large SUVs. The KDH series has much less body roll compared to the previous LH series, but it isn't great as handling of a car. I notice the difference in handling when I drive the Hiace after driving our Bluebird which has front and rear independent suspension. Comfort It doesn't handle large potholes and bumps as good as a car, but it does manage to soften small potholes pretty well. The diesel engine noise is evident compared to a hybrid or petrol vehicle but the noise reduces when the vehicle gets to the third gear or at around 70+ km/h speed. The A/C is epic on the Hiace, it is one of the best cooling A/C I have come across, I rarely have to set the A/C temperature below 26 degree Celsius on auto mode and that is without the dual A/C. There is plenty of space inside, 7 or 8 people could travel on long journeys with their legs stretched out and not crammed. The second row seat is the best place to be in, you get the dual A/C right in front of you, it is acoustic sweet spot and minimal sunlight enters the cabin. Practicality It is quite a practical vehicle if you are using it occasionally or for long journeys as it can seat 8 comfortably yet carry plenty of luggage(you could fit around 4-5 large travelling bag placed horizontally), it has got atleast double the amount of luggage space compared to a Noah/Esquire. However it is bit of waste of money if you are using it on daily basis as fuel bills are gone be crazy and parking these are not that easy within city limits. In addition, maneuvering these around narrow roads requires some skills especially roads with tight bends. Second hand value and parts Selling a KDH isn't difficult at all, if you maintain them right there will always be people willing it to buy it from you. There are plenty of body parts available but 1KD engine parts are bit difficult to find and even if you do find, it will be expensive Some used parts prices are: Pair of tail lights: 15k for older design and 30k for new design Pair of headlight: more than 100k without the HID unit Rear door: around 40k Fog lights: around 20k What I have done with my Hiace The Modellista body kit came with the van from Japan itself and I added the Modellista grill later on Original Toyota spoiler which came painted pearl white I tinted the fog lamps yellow with Nightbreaker bulbs in them I have also replaced the rear seats which are rotatable and come with a table as well I have done some electronic mods as well, Installed a transcend DrivePro 200 Carrozzeria tweeters with crossover and JBL component speakers with crossover(thanks to @TheFlyingFox) https://streamable.com/ujkce I was planning on installing FIAMM horns, but the JDM side of my brain took over and I went with Mitsuba Alpha https://streamable.com/nbipn Note: click on the links to access the videos My dad had the body kit removed for a short period of time and during that time I drove it through some muddy terrain. It did well.